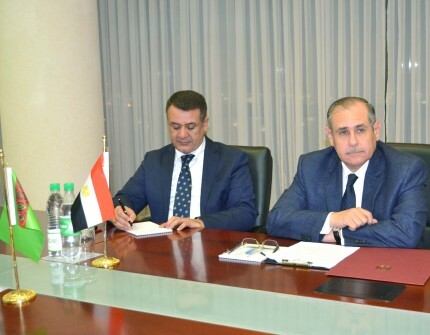 On December 10, 2018, there was a meeting at the Ministry of Foreign Affairs of Turkmenistan with the Ambassador Extraordinary and Plenipotentiary of the Arab Republic of Egypt to Turkmenistan (with residence in Moscow), Mr.Ihab Ahmet Talaat Nasr, who arrived in Ashgabat to present his credentials. At the beginning of the meeting, the parties expressed their commitment to the development of bilateral relations. After exchanging the opinions related to the development of friendly relations between the two countries and the development of bilateral political, economic and cultural cooperation, the parties noted the need for organizing bilateral meetings at various levels. During the meeting, the Ambassador of the Arab Republic of Egypt presented the copies of his credentials. Congratulating the Ambassador on his appointment to this responsible post, the Turkmen side wished him success in the new assignment. In turn, the Ambassador of the Arab Republic of Egypt to Turkmenistan assured that, for his part, he would do his best to strengthen the bilateral relations in various areas of cooperation.